Willem Lodewikus van der Merwe was born on 20 October 1957. After matriculation from the Hoërskool Dr. Malan Meyerton, Gauteng in 1975 he studied literature, philosophy and theology at the University of Stellenbosch, South Africa. He received his PhD from the University of Stellenbosch (1990) on a dissertation for which he did research in Utrecht, the Netherlands, under supervision of the Dutch philosopher C.A. van Peursen. He started lecturing at Stellenbosch University in 1987 and did research for his doctorate in Utrecht during 1989. He was promoted senior lecturer in 1992. From June 1995 to June 1996 he was Senior Research Fellow and Visiting Professor at the Institute of Philosophy of the Catholic University of Leuven, Belgium. 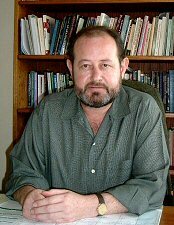 He was promoted professor of Philosophy at Stellenbosch University in 1998. He is married to Lettie Conradie van der Merwe (née Visser) and they have a son and a daughter. 1998-: Editorial cooperator of Fragmente, a journal for Philosophy and Cultural Critique. 2009: Member of the committee of the theology faculties of the VU University and the Protestant Theological University responsible to design a new \0x201Cjoint\0x201D Bachelor degree in theology. 1990: Metafoor: 'n Filosofiese Perspektief, Bloemfontein, VCHO (Wetenskaplike studiereeks 11), 205 pp. 1994: Die taalwending in die twintigste eeuse filosofie en die vraag na 'n 'eeuwendingsgestemdheid', in Wysgerige perspektiewe op die 20ste eeu, (red.) DFM Strauss, Tekskor, Bloemfontein, 1994: 89-114. 1995:	Language and literature in a postmodern culture, in Life in a Postmodern Culture, (ed. Rossouw, G.J. ), HSRC Publishers, Pretoria, 1995: 173-199. 1995: Taal in Ons postmoderne wêreld, (red.) Rossouw GJ, RGN Uitgewers, Pretoria, 1995: 53-58. 1998:	African Philosophy and the contextualisation of philosophy in a multicultural society in The promise of Multiculturalism: Education and Autonomy in the 21st Century, ed. Katsiaficas, G. and Kiros, T., Routledge, New York / London, 1998: 195-210. "Wittgenstein's legacy and the challenge to psychology" (co-authored with P.P.Voestermans) in Ludwig Wittgenstein. Critical Assessments of Leading Philosophers (second series) ed. Stuart Shanker and David Kilfoyle, Routledge: London and New York, 2002:162 - 182. "The Contextuality of Philosophy: From African Philosophy to Multiculturalism" in Perspectives in African Philosophy, ed. Claude Sumner and Samuel Wolde Yohannes, Addis Ababa University Press: Addis Ababa, 2002: 282 - 295.